"Marriage Is a Private Affair" is a story based on old times. The view of the story assumes that people are becoming more and freer to decide their lives and less worried with opinions (Achebe). In other words, according to some people, the lovers wish is the paramount decision that should determine the union. Although I would concede that some have a good point when saying, a couple is the main thing needed on a marriage, I still think that marriage is not a private affair. My claim is that the story basis what happens to almost every family in the world. At least, it is pretty much the same as I see on movies, stories and in my country. In other words, I believe that opinions, advises, encouragements coming from people that care about us, influence our ideas about marriage. My view basis on the idea that marriage means social union between spouses that establishes rights and obligations between them, their kids, and their in-laws. The idea is evident in the passage where the woman is sad as his lover has not informed his parents about her. Another point is when the kid is sad because he cannot meet his grandfather. In addition, his dad is sad because the kid is sad, so it is like a snowball rolling affecting people that are directly connected to the couple. Some may disagree with my assumption that the advice of parents, for example, is very important for the decision of a couple. Parents act as strongholds and sources of experiences where aspiring couples learn responsibilities and roles to be parents in the future. To this idea, I would respond that relatives show us what they think is right and wrong, and with or without intention, it affects decision making. Furthermore, the last decision is from the couple, of course, but others have a big influence. In many countries, especially the African continent, parents feel obligated to show their children the difference between right and wrong. However, in most cases, this obligation is exaggerated and extended to matters of personal decision making. According to the suitor’s father, he argues that ‘he owes to his son, as a duty "to show him what is right and what is wrong’" (Achebe). The implication is that any personal ideas are not welcome. Such ideas are the works of Satan, and he compares them to a person having cut off his son’s throat (Achebe). In a lay man’s language, this implies that the lack of say in the child’s life is equivalent to having them dead. However, if marriage is a union that aims at bringing the families together through unity and companionship, then the idea of imposing jurisdiction where it is not due cannot be tolerated. There are many contradicting theories and opinions held and propagated by different scholars. These views sideline personal views and propagating cultures and determining which culture is superior and better in the decisions and values they make and promote. In the old days, Shakespeare argues that ‘love is blind, and lovers do not see the things they do all compelled in the name of love’ (Shakespeare and Phelps). From this standpoint, it can be argued that the decision of who to marry lies solely in the suitor’s eyes and mind. However, comparing this view to the analysis provided by Chinua Achebe, a paradox can be observed. In the story, Nnaemeka is hesitant to make a commitment to his lover despite the love he has for her. The bottom line is especially because of fear and the consideration of his father’s opinion. He values the opinions and views that the society has instilled in the function of marriage. On the contrary, he is willing to defy the order of the society and his father’s opinion. If a marriage is a private affair, then the society has no say or obligation inn the matter (PURCELL). However, this is contrary to what the author upholds in the story. According to his view, the parents and the society are mending in the affairs of the individual when it comes to choosing who to marry. There is one thing that the society overlooks in this case; they are not the ones to spend their entire lives with the individual. From a biblical perspective, one has the freedom to choose what pleases him based on the bottom line that till death do they part. Therefore, if a decision surpasses in such a turning point in an individual’s life, it will affect their entire lives. A conjecture can uprises on the lines of religion and upbringing. Different societies practice different faiths, beliefs and observe different holistic nomenclature. All these are the determining factors that correlate the needs of the society and their expectations from their members. It is human nature to enjoy and exercise the right and freedom of choice. If one has no ability to determine for themselves who to marry and when, one is inclined to feel that their freedom of choice is being suppressed. The need to break loose from such chains be it societal based or family based leads to drastic changes in the mode of decision making. In most instances, a sharp gap or individual relation exists one the individual starts acting out of line and away from the expectations of the society. The society sidelines they and treats them as outcasts and not respected or valued as instruments of change. If such a scenario occurs during the decision-making process of a marriage, the institution stops to be one that brings unity, but poses division and results to feelings of hatred. The opinion that marriage is a private affair is valid and has been seen to result into unquestionable choices that individuals can relate. If the decision to marry an individual is one that is free, then the two will be well equipped to challenges that they may face later in their marriage lives. However, in most cultures, the elders have an exclusive say on who one is to marry and their supporting reasons for the same. In the story, for example, when Nnaemeka breaks the news to his father the resulting questions are the girl's background and who her are her parents (Achebe). In this case, society has inculcated the view "that the fruit does not fall far from the tree" (Madden). If an individual hails from a certain society or family, one will exhibit the characteristics, practices and norms either good or bad of their people; this is the implication. Character is hewed based on the decision of the individual. The belief that one is only inculcated to the society based on what their predecessors practice or belief is not entirely true. If the decision on who to marry and live with is free and not imposed on an individual, norms and practices are bent to change. The idea is that such a belief will not crop from a society setup but on a family background. The family finds itself on love, mutual consent, and the upbringing of the children will promote the essence of personal decision making without interference (Madden). The inference is that the resulting generation will practice independence making marriage a private affair. Achebe, Chinua. 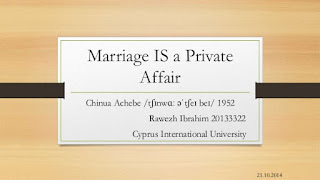 'Marriage Is A Private Affair'. World Literature. Ed. Joe Smith. New York: Prentice Hall (2003): 1202--05. Print. PURCELL, William F. 'CONVERTING CULTURE: READING CHINUA ACHEBE's MARRIAGE IS A PRIVATE AFFAIR IN LIGHT OF BERNARD LONERGAN's THEOLOGY OF CONVERSION'. Religion \& literature 45.1 (2013): n. pag. Print. Shakespeare, William, and William Lyon Phelps. The Merchant Of Venice. 1st ed. New Haven: Yale University Press, 1923. Print.